Pluto and Charon: New Horizons probe sees them orbiting each other. New Horizons Sees Pluto and Charon in Motion! Pluto and Charon, seen by the ALMA radio observatory … or maybe it’s actually Trelane’s parents. The New Horizons probe was launched in 2006 on a fast track to Pluto. This small spacecraft is packed with instruments designed to study Pluto and its system of moons, and will fly by the world in July 2015, just under a year from now. 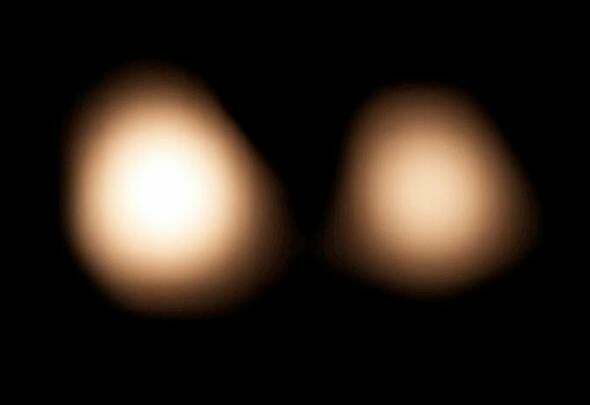 It’s had a series of milestones along the way, but a new one is pretty significant: It’s been able to get images of both Pluto and its largest moon, Charon, and can see the two orbiting around each other! Pluto and Charon doing their gravitational dance. Note how the stars in the background remain motionless. That animation shows the two rocky ice balls in motion. It was taken with the Long Range Reconnaissance Imager, New Horizons’ main camera, when the probe was still well over 400 million kilometers away. The animation shows Pluto and Charon over the course of six days, from July 19–24, 2014. To give you a sense of scale, Charon orbits just under 20,000 km (12,000 miles) from Pluto; our home planet, Earth, would fit in between them with a few thousand kilometers to spare. As a moon orbits its planet, the planet moves, too. What’s most amazing about this is that you can see Charon orbiting Pluto, but you can also see Pluto wobbling over the course of that time too! Charon is pretty big compared with its parent, with about 11 percent of Pluto’s mass. That’s enough that its gravity pulls on Pluto pretty hard, so the two actually orbit around the center of mass of the system, called the barycenter. That’s true for any two objects in orbit, but because Charon is so massive, that barycenter is located above Pluto’s surface. Picture two kids of different sizes facing each other, holding each other’s hands, and then swinging around; the big kid makes a little circle, and the little kid makes a big circle. In this case, Pluto is the big kid. Zooming in, and the motion of Pluto around the barycenter is more apparent. Not that Pluto is all that big. With a diameter of 2,370 km it’s far smaller than even our own Moon. But that’s enough to hold on to the five moons that we’ve discovered so far—it’s expected New Horizons may see more. And we know very little about it; it’s small and so far away that even our biggest telescopes struggle to see anything more than patches of different brightness and colors on Pluto’s surface. Is it geologically active? Is Charon? Pluto has a very thin atmosphere; what will it look like seen up close? New Horizons will fly through the Pluto system, skimming the world at a distance of under 10,000 km (6,000 miles). This is an estimate; the exact position of Pluto and its moons is being refined as the probe approaches. The blobby image at the top of this article is from the Atacama Large Millimeter/submillimeter Array radio telescope, which sees the radio waves emitted from the cold worlds, and can get more precise positions for them. Ground-based observations are being combined with those from New Horizons itself to plot a more accurate course for the spacecraft, so it can be placed just where it needs to be for the Pluto flyby. That close encounter will last about a day, when the probe is close enough to see lots of detail on Pluto. It’s too bad it can’t last longer, but Pluto orbits the Sun at a distance of several billion kilometers, and you can either get there quickly and have a short encounter, or have a longer encounter but a travel time of decades. Opting for a fast flyby is a compromise, but a good one. We’ll get to see this weird little place up close for the first time in history. What will we find? No one really knows … but that’s why it’s called exploration.